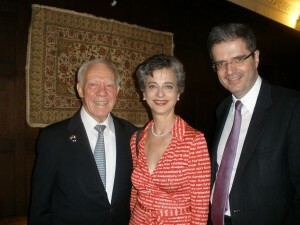 ISH is s addened by the death of Former Congressman and ISH Board Member James Oberstar who died May 3 at the age of 79. Mr. Oberstar, who was the ­longest-serving congressman in Minnesota history, was first elected in 1974 and joined the ISH Board in 2012. Mr. Oberstar was actively involved in the life of the House as the chair of the Buildings and Grounds Committee and a member of the Governance and Executive Committees. He supported resident programming with enthusiasm. Mr. Oberstar, who was fluent in French and was awarded the rank of Commander in the National Order of Merit by the French government, served as moderator for the ISH program last spring with Ambassador François Delattre at which he discussed France’s military involvement in Mali. As an avid cyclist, Mr. Oberstar planned to help organize and participate in the annual resident bike ride to George Washington’s Mount Vernon estate. Jim was born in 1934 in Chisholm, Minnesota. He graduated from the College of St. Thomas in St. Paul, Minnesota, in 1956, majoring in French/Political Science. He continued his education in Belgium, Quebec and Washington, D.C. Jim worked in Haiti from 1959-1962, teaching French, Creole and English. “Jim was a true believer in the power of international student exchanges and strongly supported our mission. He will be dearly missed by the ISH-DC community” said ISH Executive Director Tom O’Coin.